A North Carolina lawmaker is determined to derail $900 million in federal funding for a rail and tunnel project from New York to New Jersey considered likely to be part of a $1.7 trillion omnibus spending bill the House is expected to pass this week. 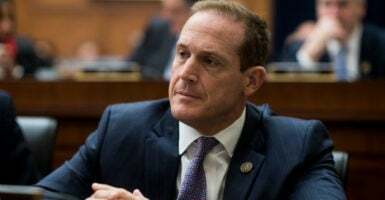 Rep. Ted Budd, R-N.C., has been working since September to keep the funding for the $29.5 billion Gateway project out of any such spending bill. President Donald Trump threatened on March 8 to veto the omnibus spending bill if it included the funding for the project, but that move could complicate efforts to avoid another government shutdown March 23. Budd said in September that the funding violates the House’s 2010 ban on earmarks—public funding for special interests and projects that congressmen can add to a budget without merit-based competition. “We are in the era of no earmarks, and we certainly see one, essentially a $900 million earmark … called the Gateway project,” Budd told The Daily Signal in a phone interview in September, when he was fighting to keep the funding out of another spending bill. Now at the 11th hour, with a potential government shutdown looming, Budd is persisting in his efforts to ensure wasteful spending is held to a minimum. “This would be the largest federal rail boondoggle ever, and one of the biggest earmarks ever,” Budd told The Daily Signal on Monday. “The cost has gone from $13.5 billion in 2011 to $29.5 billion in 2017 without any major construction. I’m trying to shut this thing down before the federal taxpayer ends up on the hook for a project whose cost overruns seem endless,” he said. “If New Jersey and New York want to put up real money, stop trying to bully Congress into funding the whole thing, and take their share of the responsibility for cost overruns, I’m happy to take another look,” he said.